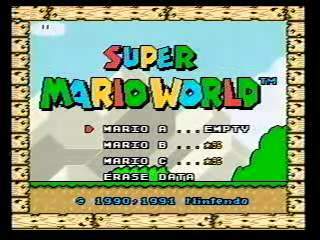 Super Mario World launched the Super Nintendo system in November 1990 (Japan) / September 1991 (US) and helped create the 16-bit gaming era. The game introduced Yoshi to the Mario universe, the dinosaur with an infinite appetite. Best time: Single-segment 0:10:29 by Jon O'Rourke on 2012-08-13. Best 100% time: Single-segment 1:25:19 by Jon O'Rourke on 2012-11-18. Single-segment: 0:10:29 by Jon O'Rourke. One of the first games I ever beat as a kid, I thought it would be appropriate to make it my first speed run. This run is similar to the previous run on the site with 2 noticeable improvements - killing Bowser with a cape and the orb glitch. Doing these saves about 20+ seconds. Shout outs to everyone in my stream, Blechy for teaching me the skip, Minion and Fuzzey_Ninja with the good times picking up the game, racing and making the wiki - Sicko for convincing me to start doing RTAs, Sluip, Cronikeys, Wawlconut, Something915, Carl_Sagan, feasel, milkshakebot, dunnius, cyghfer, Kassiuz, Garrison, MSDS, jape, spimmmm, ChristosOwen, Prier and everyone else who i didn't mention in #yoshi and number smw. Thanks also to the Japanese community who have showed us many tricks and had good times racing; Yaposon, menboo, latte, akimi, lemongrass, ZRSB, and everyone else. Also thanks to the TASers who have optimized this game about as much as possible. 100% (96 exit): 1:25:19 by Jon O'Rourke. Super Mario World 100% has changed a lot over the past year, in particular thanks to Cronikeys and Wawlconut who saved a lot of time with new routes through various levels. I didn't have a goal for this category, just wanted to get a run that didn't have major mistakes. Thats pretty much what I got here. The clips in Vanilla Dome 2 and Forest of Illusion 2 are not too hard with practice - but still rely on some rng luck to actually clip fully through the wall. Aside from that, most everything else is straight forward from watching the run or explained on www.smwwiki.com. I had a lot of fun with attempts and maybe will look to come back to this one day. It is possible to get under 1:25:00 with the route I used. Enjoy!